Toddler Books: Start the love for reading now by introducing soft books with interactive pages that will capture the interest of your baby! Infants love anything they can look at, touch, hear....books can help to develop all of these senses. Everything at this age is a "toy" so it is a wonderful time to take advantage of this. 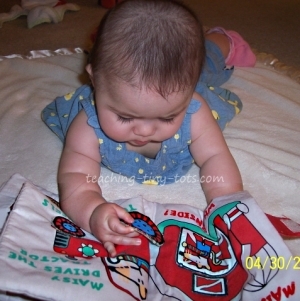 Cloth Books or Soft Books are perfect for infants. There are a number of brands that are designed for birth and up. Priddy Books is another brand that I really liked with pages that make a crinkly sound, have different textured pieces and even a few you can lift like a wing on the duck. Fuzzy Bee and Friends was one of our favorites. Hand or hold the book in front of your child...Congratulations! You have just introduced the first Reading Readiness Skill! Which is the front of the book, and which way is up! Now just talk about the pictures or the colors. You have just introduced another reading readiness skill. Reading is more than just being able to read the words. Comprehension is key to a successful reader and it is developed by learning to look at picture clues. Now let your child spend time with the book. Carry a few for stroller trips. Some have rings that you can attach to car seats or stroller straps to keep from falling. These books are cloth so most are washable. Bargains can be found at yard sales, eBay, church sales and other used book sources. If purchasing pre-loved, be sure to check condition for loose pieces, strings or other potential hazards.